Money: The work doesn’t get delegated because you can’t afford to pay someone to do it. You do the work yourself because it’s “free.” Of course it’s not really free to do the work yourself because of the opportunity cost. It’s probably a margin issue in the business model. The margin generated is insufficient to support the true needs of the business. Rather than fix the margin issue, you artificially subsidize the business with the donation of your “free” time. Trust: Employees never do the work as fast or as well as you do in the way you want it done. That’s a given. This issue may not be a pure business model issue but it affects the business model. By denying your business model the leverage you could provide by delegating work, you’re underperforming. 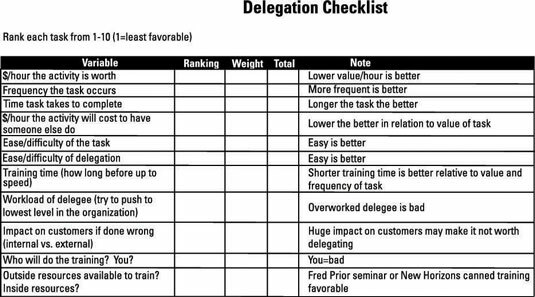 Use this checklist to decide the best work to delegate. Talent: It’s not that you’re unwilling to delegate, you’re unable to. Your staff simply lacks the required talent to complete the work. To clarify, sometimes it’s difficult to tell whether the staff is poorly trained or under-skilled. The symptoms are the same. If the issue truly is the caliber of your staff, the root cause in the business model is insufficient sales or insufficient margin. Of course, you could just be a lousy judge of talent and need to hire better, but that’s rarely the case. If it is, hire someone to do your hiring for you. If the issue is sales related, create a more sellable product or a better sales process. If the issue is insufficient margin, raise prices or innovate. Cheapskate: Sometimes business owners have the money to pay to delegate, but they don’t do it. There’s smart cheap and there’s dumb cheap. Smart cheap is typically achieved when the business is young and requires you to perform many jobs to avoid hiring a full employee for half a job. Dumb cheap is when you make the bad decision to keep the pay of the employee rather than leverage yourself. Training: The traits that make for a great entrepreneur tend to make for a lousy trainer. Entrepreneurs tend to lack the patience and detail orientation required to train effectively. Sometimes employees have plenty of motivation and talent to perform the skills, but the entrepreneur fails to give them the tools they need to succeed. Investing in your employees’ training is a wise investment. It’s very difficult to over-train someone. Fix your delegation issue and you’ll have the ability to better leverage your business model.